Yak on the ground...wings folded? I don't know about that, i am very skeptical of this "F-35 is over-expensive crap" thing. A mainline fighter jet is an essential pillar of any modern armed forces and this is especially true for US/NATO whose main thing is to destroy defenseless nations with the least own casualties possible. They wouldn't joke around with one of the pillars of their military power. This F-35 is inserted in this "5th Generation/Everything-Interconnected" thing, it was not designed to be a stealth F-16/F-15/whatever (like the F-22 was). 5th Generation is the "whole" not the "individual". Also remember that they plan to build more than 2000 and they are preparing all kinds of new weapons to equip it. Edited by Pete_V, 09 February 2018 - 12:48 PM. As the millions of Americans wander the streets looking for nonexistent jobs and the government claims there is no money available for anything useful, rest assured that the private military industrial parasites have managed to somehow siphon off $1.5 trillion of public money into a boondoggle that even falls short of a jet developed way back in 1974. The American F-35B short takeoff and vertical landing aircraft has its origins in a secret collaboration between Russia’s Yakovlev and Lockheed Martin of the United States. The American F-35B – the naval version of the Joint Services Fighter – was not designed in Fort Worth, Texas, but in Moscow, Russia. The ‘unique’ lift fan and vectoring tailpipe that allows the F-35B stealth fighter to perform vertical takeoffs and landings (VTOL) was designed nearly three decades ago by Russia’s Yakovlev aircraft bureau for their supersonic multi-services fighter, the Yak-141. The Yak-141 was a successful development of the older Yak-38 jump jet. A good example of Russia’s poor record in naval aviation, the Yak-38 was an apology of a fighter, being outperformed in almost every department by its Western rivals such as the highly successful British Sea Harrier. As part of the Soviet Navy’s massive expansion under Admiral Gorshkov, in 1975 Yakovlev was ordered to develop a highly versatile aircraft. Having an unprecedented blend of supersonic speed, vertical take-off and landing capability and extended range, its main role would be to defend the Soviet Naval Fleet and shipping lanes. The aircraft would not only operate from aircraft carriers, but also from wheeled landing and takeoff platforms that could be placed throughout the country, allowing the Russian Air Force to come into the picture. In 1977 the aircraft got the green light for full development. By March 1987 came the first flight and the first hover was carried out on December 1989. During April 1991 test pilot Andrei Sintsyn set 12 world records for vertical takeoff and landing aircraft that were recognised by the FAI. But trouble would soon bring down this highly promising fighter. On October 5, 1991, a prototype aircraft crashed while attempting a carrier landing. Then came the funds crunch following the dissolution of the Soviet Union. This meant that Yakovlev was now on its own – it had to get funds from somewhere. Trying to stay airborne in the turbulent skies of a collapsing empire, Yakovlev started looking for a foreign partner. One of the successes it notched up was the development of the Yak-130 trainer in partnership with Aermacchi of Italy. The other partnership was with Lockheed Martin. In the early nineties, the United States military decided to replace its F-16, F-18 and A-10 fighter-bombers with a common family of aircraft for its three services that operated fixed wing aircraft. Lockheed Martin was one of the companies trying to land the multi-trillion dollar Joint Strike Fighter contract. Since American designers had no prior experience in VTOL development and the British Jaguar was outdated, they saw the potential in Yakovlev’s design. According to aviation analyst Bill Gunston, the Lockheed-Yakovlev partnership began in late 1991, though it was not publicly revealed by Yakovlev until September 6, 1992. Lockheed-Martin disclosed the deal only in June 1994. Lockheed pumped in nearly $400 million. For Yakovlev the fruits of the partnership were three new prototypes and an additional static test aircraft to test improvements in design and avionics. Two prototypes of the planes were exhibited at the 1993 Moscow air show. None flew. The real winner was Lockheed. Its designers had struck gold – they had learned enough about “lift plus lift cruise” techniques from the Russians to design their prototype Joint Strike Fighter, known as the X-35, in preparations for a fly off against the Boeing X-32. The Russian advantage paid off handsomely. In a close fight to the finish line, the Yak-inspired X-35 got the contract. 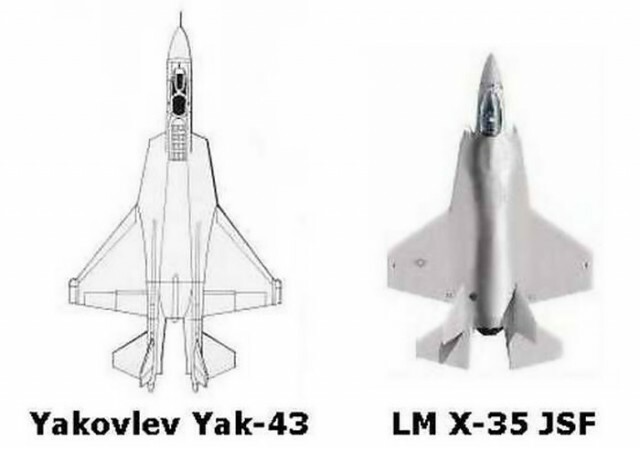 The similarities between the F-35B and the Yak-141 are not just in the engines, nozzles and fans. The two aircraft even look alike in terms of appearance – like twins separated at birth. This is hardly a coincidence because under the hood of the American plane is a Russian heart. There is another clue about the shared DNA of the two planes. Strategy Page reports that over the last five years, testing of the “B” version of the new American F-35 fighter showed that its engine generated enough heat to damage carrier decks. The Yak-141 had an eerily similar problem – it was also known to damage runways and decks it operated from. Military Today says Lockheed-Martin “possibly used experience gained from this project developing their own F-35 multi-role fighter”. The real truth may come years later when or if someone from the Russian or American side sits down to pen down their memoirs. 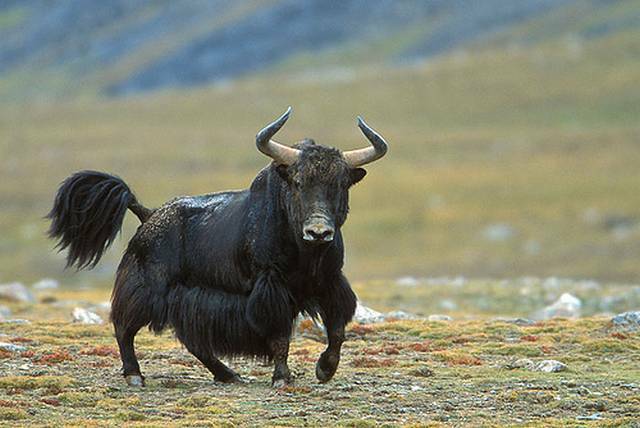 Until then, all we can say is if it looks like a Yak, flies like a Yak and acts like a Yak, it must be a Yak.